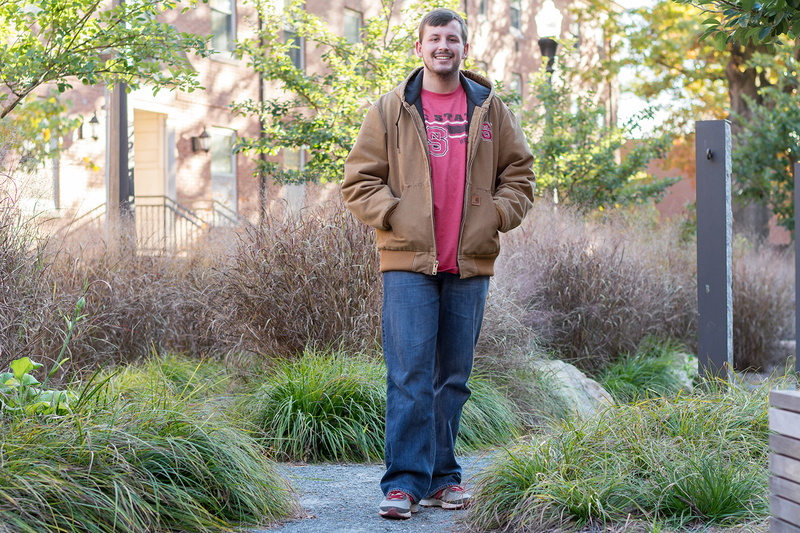 Lane Willis ’18: My name is Lane Willis and I am a senior in polymer color chemistry in the College of Textiles. I am from Mooresville, North Carolina and I have lived in the same house since I was one. I grew up in a suburban area and this upbringing, along with the influence of my parents, helped guide my upbringing and led me to being the person who I am today. I was brought up by my mom Traci and my dad Mark, and grew up in a Christian home, going to church Sundays and Wednesdays. I grew up with a younger brother, Connor, and a younger sister, Anna Kate. Growing up as the oldest child instilled in me a passion for guiding and helping others, giving advice, and protecting people. My sister also grew up with cerebral palsy, only further instilling the desire to help and aid others. As I grew up, I began to become interested in sports. I played any and every sport imaginable, but I enjoyed playing baseball the most. I started playing baseball at the tee-ball level at age five and have continued playing baseball, or slow pitch softball or some other version every year of my life. In middle school I began wrestling and this begun a journey of one of the most difficult things I have ever done. Wrestling challenged me physically and mentally in ways I had never experienced before. The hard work and determination needed to stay with wrestling taught me to never give up, no matter what was thrown my way. Wrestling taught me about failure, and that it was alright to fail, if I got back up and moved forward. Some hobbies that I pursue include: watching sports and movies, playing spikeball, and shag dancing. When I have free time, my favorite thing to do is play spikeball with my friends. I would prefer to be outside than inside, especially on a pretty day. I also enjoy hiking, using my ENO to hang in trees, and taking in beautiful sights. Definitely the most important part of my life has been my relationship with Christ, and pursuing this wholeheartedly. All of my choices are based out of this, whether it is as small as whether or not to attend an event, or as large as what I am doing after college. My faith is of utmost importance to me and I love to talk about it! I am a jovial, loud, fun-loving character who values loyalty, honor, and integrity, who also integrates his extroverted presence into everything that he does. My life as an NC State student has been a whirlwind, sometimes moving very quickly, and other times moving quite slowly. As a senior, I look back and ask myself, where did all the time go? How am I already a senior? My time at NC State has been a combination of school, sports, scholarship, and spirituality. Each of these has taken up a major role in my time in college as I try to split my time among these activities. Currently in school I am involved with undergraduate research, College of Textiles organizations, as well as the usual amount of class time. I started undergraduate research this semester and I have been pleasantly surprised with how much I have learned. Research has challenged me this semester due to the frustrations and failures experienced in research. During research, I have learned the need for patience and for trial and error as a lot of the experiments and methods have not worked the first, second, or eighth time. This has also shown me a different side to academia that involves hands-on research. I have thoroughly enjoyed this kind of learning though. During my time, I have gotten to apply simple chemistry skills on a more in depth scale and I never imagined that chemistry could be used this way. I have gotten to work with the mass spectrometer and liquid chromatography device. Using these two devices I have seen a new side to learning through discussion, real-life problem solving, and data analysis. The most remarkable thing about research to me is the scale at which one small change can affect everything. This can easily be applied to life, as many small changes in the day can lead to large change in lifestyle, a lot of times for the better. Outside of research, I am also involved in the College of Textiles leadership fraternity, Kappa Tau Beta, and am a College of Textiles ambassador. Through these two organizations, I have been able to get more involved in the College of Textiles and give back to the College that has invested in me through the classes I have taken and the professors who have taught them. Through both organizations, I can also impact the next generation at the College of Textiles through being involved in the decision-making process and having a say in the way things are run. Another sphere that I am a part of is the sports world, whether it be playing pickup spikeball or sitting on the front row of a football game. One of my favorite places to be while at NC State has been the front row of section seven-eight in Carter Finley. This is the front row of the student section on the 10-yard line. If I am at a home football game, you will find me here, a lot of times painted up as part of the #wolfpacknation group. A phrase that sticks with me from the Alma Mater is “Our hearts ever hold you NC State, in the folds of our love and pride.” I have a lot of pride for NC State, and love being here. Whether that is supporting the sports teams, or just showing off the campus, I enjoy giving my all at this school. One of the main lessons that [the Goodnight Scholars] Program has taught me is that through hard work and determination, anything can be possible, all you have to do is believe in yourself, because the Goodnight Scholars Program has always believed in us! 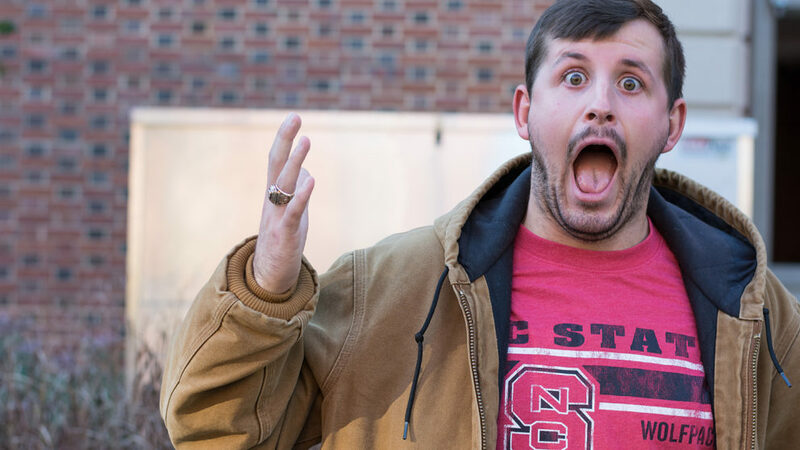 Overall I have experienced probably every major event that could be possible at NC State. I have gone to every sport possible, done research, ran in the Krispy Kreme Challenge, built some awesome objects out of LEGO at the Brick Build, served with Service Raleigh, played intramural sports, and been to Packapalooza. I am not sure how much I have left to do. I look back on my experience and would definitely say that I haven’t missed out on much and have done everything I could ever have wanted to do during my time here. One experience I want to have at NC State before I graduate would be to win an intramural championship. The IM championship shirt is one thing that I have yet to achieve through all my participating in sports at NC State and I would love to claim one of these for myself, yet that has not happened sadly. My time in the Goodnight Scholars Program has been absolutely incredible. From the social events such as the Bye Week Tailgate and the Thanksgiving Potluck, to the professional events such as the Real Leadership Series, the SAS Emerging Leaders, and the networking events, to the service events such as Shack-a-thon and Service Raleigh, each and every minute spent with the Goodnight Scholars is beneficial and helps me to move forward. I have felt invested since the moment I met my retreat leader and then mentor, to meeting the pro staff and then the many scholars above and below me. Every step of the way there has been someone to lend a hand if needed, to give advice, or just to chat with. This isn’t just a normal program, it is a family of about 210 scholars that always have your back. The multitude of events help us as we move towards a professional degree, simulating what it could be like for life after college. I feel much more prepared to proceed in my life that I ever thought I would have due to the Goodnight Scholars Program. With the Goodnight Scholars Program, I have gotten to be a retreat assistant, mentor, and an ambassador. I have gone to Boston, New Orleans, and Savannah with the Program while enrichment grant funding helped me go to Alaska. Without this Program, I could never have experienced a third of what I have while I have been in college. One of the main lessons that this program has taught me is that through hard work and determination, anything can be possible, all you have to do is believe in yourself, because the Goodnight Scholars Program has always believed in us! One of my favorite memories in the Goodnight Scholars Program thus far would have to be my first-year. The Goodnights Scholars were given box tickets to watch Trans Siberian Orchestra perform in PNC Arena. We got to attend and sit in a box seat and live like we were on top of the world. I personally love the Trans Siberian Orchestra, so the combination of sitting in a box and watching this group was absolutely exhilarating. We were treated like VIPs and got to go to some restricted areas in PNC that I haven’t gone before or since. This experience epitomizes my time with the Goodnight Scholars as they have given me ample opportunities to do things that I have never done before, and pushed me further than I ever thought I was going to go. When I think of a Goodnight Scholar, I think of a couple of words: distinguished and determined. To me, being a Goodnight Scholar means living up to the investment that has been made in me and changing the world, whether that be the entire world, or just one person’s world. A lot of times today, people want to make an impact and to change the world yet don’t know how. My view of changing the world is a little different. I think that if I make life better for even one person, then I am changing their world, and ultimately changing the world. As Goodnight Scholars, we have a tendency to dream big because we feel a pressure to change the world. We are distinguished as Goodnight Scholars because we as a group not only think big things, but do big things. We hold ourselves to a high esteem, and everyone else that knows the name begins to think this as well. We are determined as Goodnight Scholars because this is just our nature. Each and every individual in the program has a drive about them to keep moving forward, whether that’s through learning, serving, or paying it forward. Determination is a key to success and I can see that in every Goodnight Scholar. Being in a community like such as this challenges me to keep being determined as well, which definitely helps me out a lot.